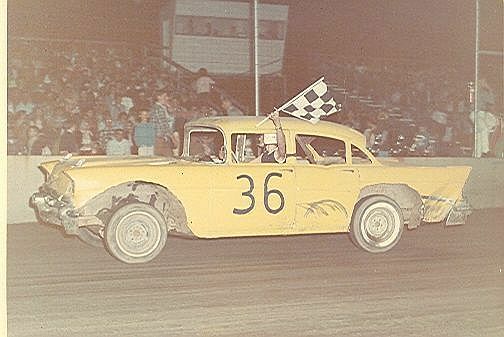 This '54 Chevy with 235 6-cylinder powerglide was my first race car. 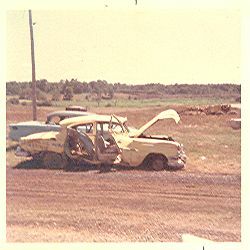 On July 29, '66 another car spun down into me, turning me off #3 at Avilla (IN) Speedway. I hooked a rut big time, and rolled end-over-end 6 times down into the woods where SR 3 is now. By the time we returned the next day to load the car, somebody had helped themselves to all the wheels and tires (except the one that was ruined), and various other parts from the car. This is the accident that started my back problems, causing my spinal fusion in '97. This '53 Chevy had a 216 6-cylinder with a 3-speed manual. Despite the smaller engine, this was a much faster car than the '54. This car made a run from the 36th starting position to 3rd finishing position one Saturday at Avilla Speedway. 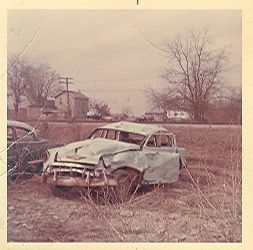 On Aug. 27, '66 another car turned down into me on the Avilla front stretch, pushing me into another car. That turned us both sideways, and with the inside car pushing me, I barrel-rolled 4 times. Result, done racing for the year. 2 cars down and money run out! The one that started it all! My first win!! 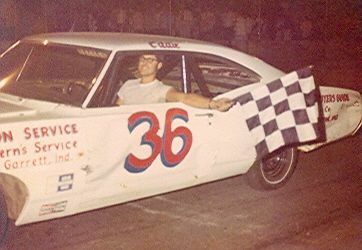 I won my first race in September '67 at Avilla Speedway. I can still remember the thrill like it was yesterday!! I bought this '57 Chevy from a neighbors brother for $20. A distributor cap and a battery made it a running car. $15 worth of black pipe from a salvage yard was used to build the roll bars. I ran it for a while with the original 283 powerglide, but ended up breaking a piston. For $65 and my old motor, I bought a "powerpak" 283. With the addition of a $25 Wolverine cam and a $16 set of solid lifters it really brought this ol' car to life. 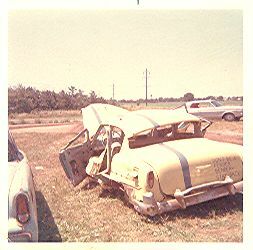 I won 3 races with this car, my first win in '67, and 2 more wins in '68, the last year I raced before being drafted into the Army in April '69. 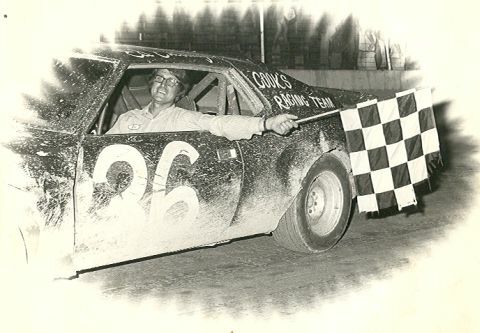 1974 Avilla Speedway RoadRunner Track Champion. '67 Impala . 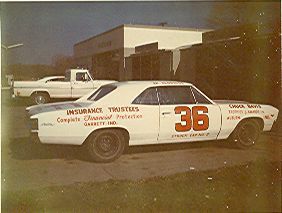 This was the first "Strock car" I drove, owned by Keith Strock from Garrett, IN. 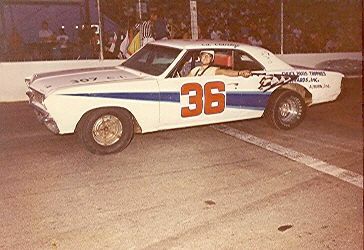 This was the first stock car that Keith ever owned, he had sponsored a number of cars previously. In '75 Keith Strock and I again built a new car. We built this 67 Chevelle (Strock Car #2) to compete in the Sports Stock class at Avilla (we may have been called Pro Stocks). 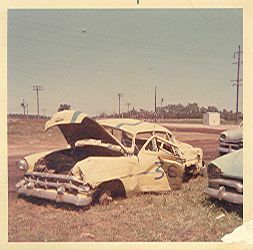 I took 3rd in the track championship with this car, while Don Pinkerton took 9th in my backup car, the '67 Impala (even with a late start to the season). Keith was very happy to have both cars in the top 10 in points. In '76 we upgraded the cars to the new "Semi Late Model" class at Avilla Speedway. I took the track championship again, Don Pinkerton took 5th. Both cars were feature winners. Keith was very proud as a car owner to have both "Strock cars" in the top 5 in points! Our consistency was incredible this year. I only had 2 dnf's (did not finish) the whole season, both of them due to blown tires. The 2nd dnf I blew a right rear tire while in 2nd place in the feature with a few laps to go. It threw the car sideways, sliding down toward the infield. When I slid into the dirt, the wheel dug in, causing a slow roll-over onto the roof. It was so slow going over, I thought the car was going to balance on the right side. There I was, laying on the roof, like a dog with all 4 paws in the air! 5 point harnesses don't release so easy when you're hangin' on 'em, but it didn't take me long to get them unlatched and get out of that car. All I could think was "what if it catches on fire?". If we could have had a few minutes to add oil and change the tire, we could have finished the race. In '79 I ran this '72 Javelin AMX at Avilla Speedway, Bryan (OH) Speedway, Warsaw (IN) Speedway, and Oakshade (OH) Raceway. This is one of my feature wins at Bryan Speedway. This is my all-time favorite pic! The Javelin at Oakshade Raceway in '79. This is a perfect action pic of dirt trackin'!! Powersliding thru the turns, wheels cranked right (turnin' right to turn left), the dust boilin' off the back tires!! I LOVE THIS PIC!! I want a copy of it buried with me!